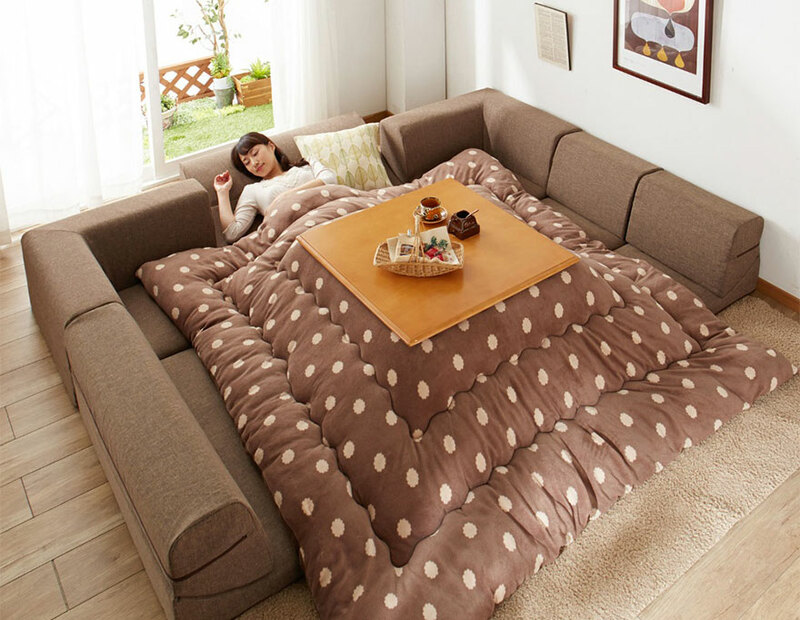 Perfect for those cold winter days when getting out of bed feels like a chore, kotatsu tables let you stretch and socialize while staying cozy and warm. 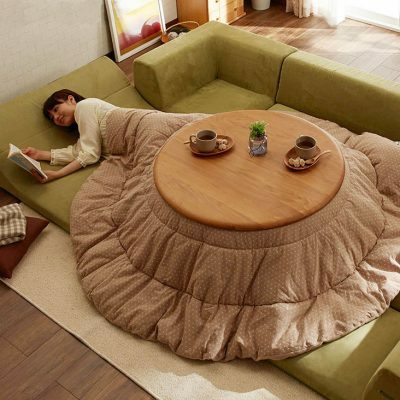 Contemporary versions of this ingenious design generally consist of a table with an electric heating element underneath and thick blanket or quilt on top. 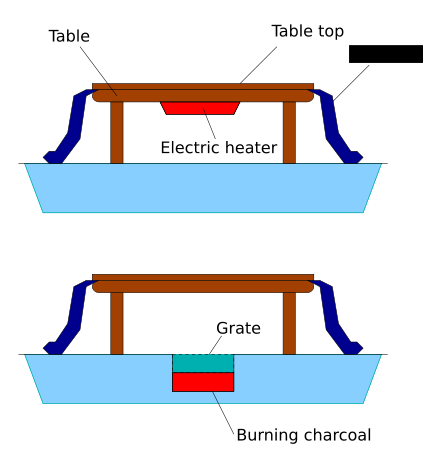 This, in turn, is generally topped with another flat layer, providing a shared surface and holding the covers in place. Families can sit comfortably around these heating tables while eating, playing games, reading books, watching television or taking naps. 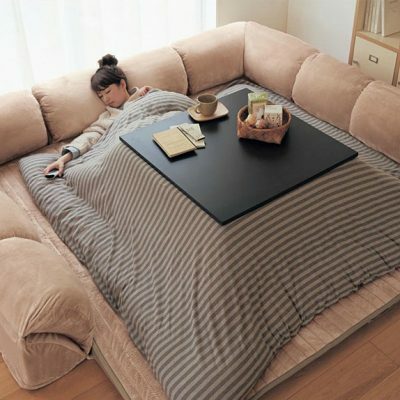 Kotatsu have historically served a vital function in traditional Japanese homes where insulation is often sparse and whole-house heating is correspondingly difficult and expensive. Traditional Japanese clothing also lends itself especially well to this form of space heating, with warm air flowing up through the folds of kimonos and out the neck and arms. 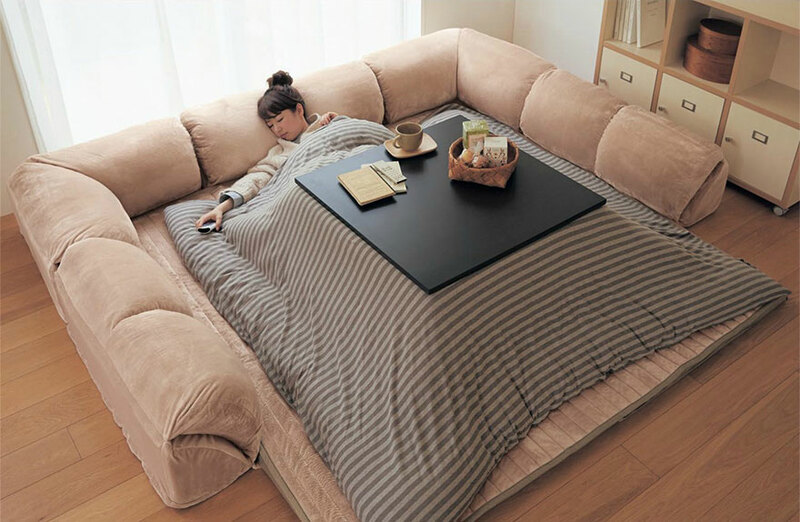 The kotatsu traces back to a 14th-century innovation: the separation of cooking irori from the space-heating functions of traditional household charcoal burners. 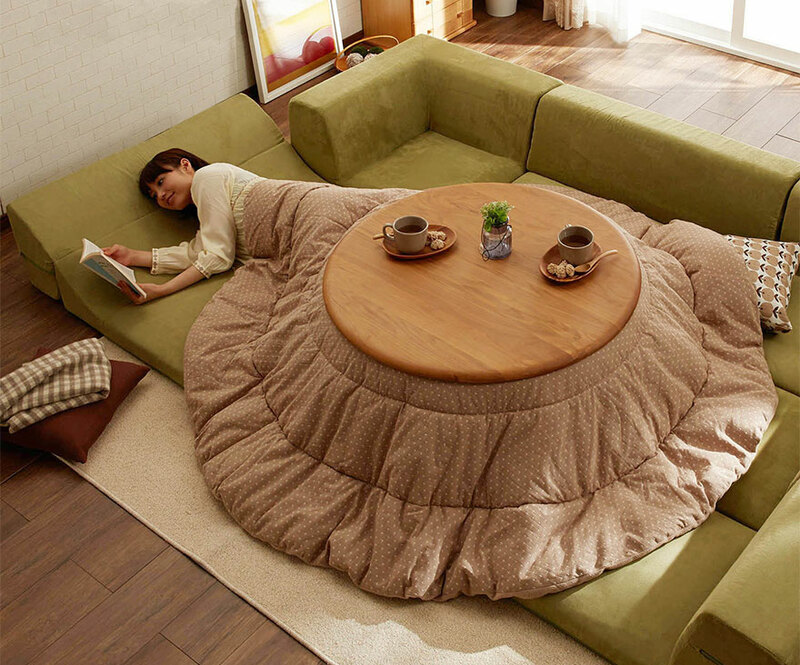 Set in floors, these heaters generated warmth that was trapped under an evolving system of tables and blankets. Over the centuries, the design was refined with earthen pots placed on tatami mats, making the system more portable. The kotatsu eventually became fully mobile (and safer) over the last century as electrical heating elements were added to the mix. 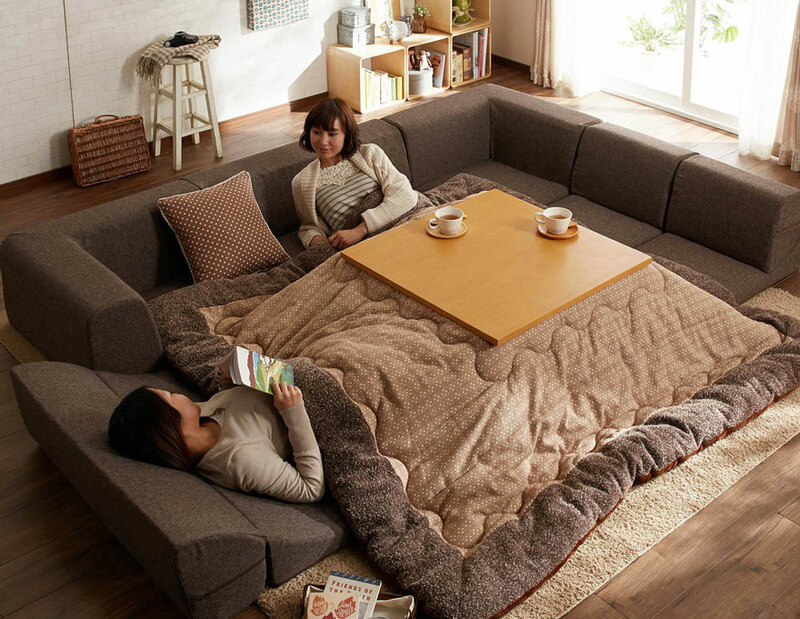 Most kotatsu tables historically were low to the ground, suitable for sitting on the floor. For those not used to that practice, a floor chair (zaisu) may be worth adding for back support. 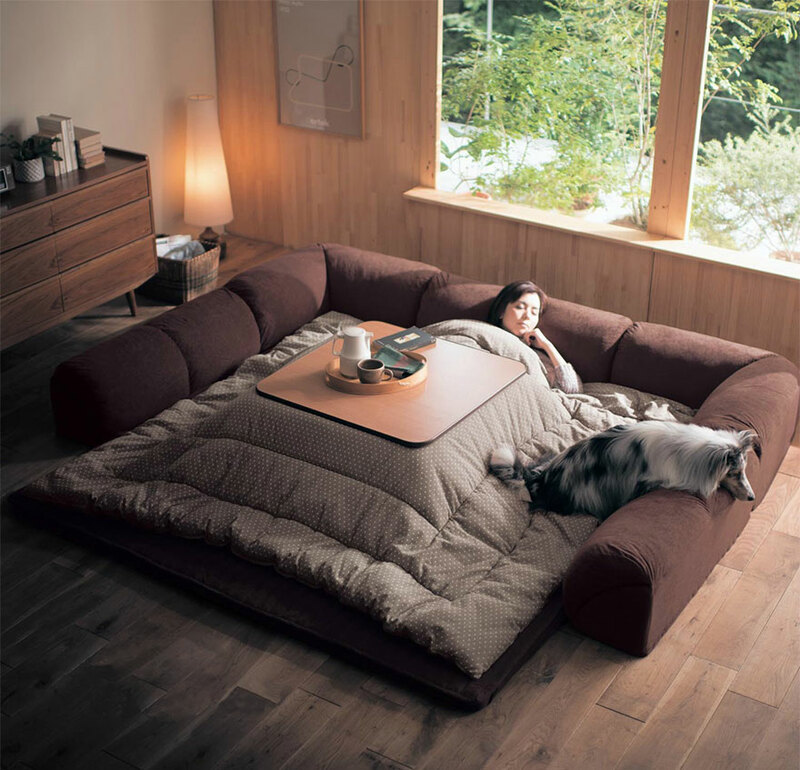 Meanwhile, some contemporary versions are also raised up to work with elevated seats. 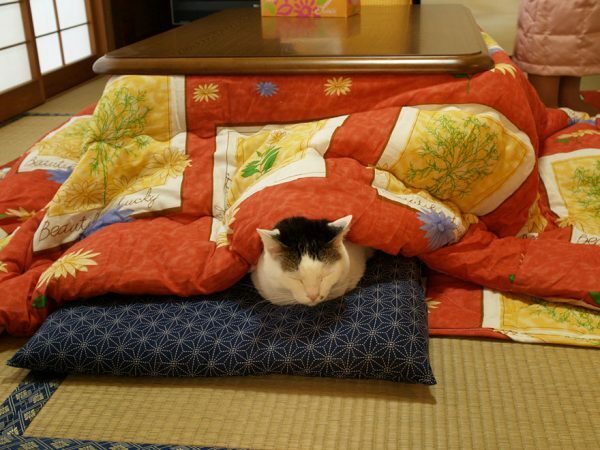 In most configurations, a light blanket (shitagake) is draped over the frame, which in turn is covered by a second heavier blanket (kotatsu-gake). Like any interior furnishing or fixture, these are designed or selected to fit in with a given home’s décor. In warmer months, the covers can be put in storage and table left out for everyday use. 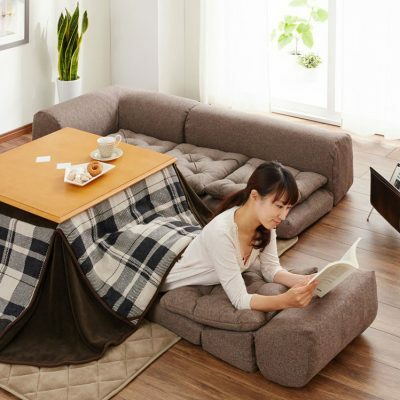 Clearly some of the advantages of the kotatsu evolved from needs and conditions specific to Japan — thin walls, loose clothes, floor sitting and so forth — but there are good reasons to export the design as well. Like traditional hearths around the world, these tables bring families closer together around a single heating source. In addition to saving money and energy through efficiency, these non-fixed furnishings can be also be moved to fit the changing layouts of a given interior. Also unlike fixed-in-place wall fireplaces, these can be quite literally gathered around — people can fully encircle the central source of heat. Given their success in Japan, it should come as no surprise that analogous strategies can be found in other regions of the world, including the Iranian korsi and Spanish brasero as well as the less sophisticated foot stoves used in Europe and the United States. 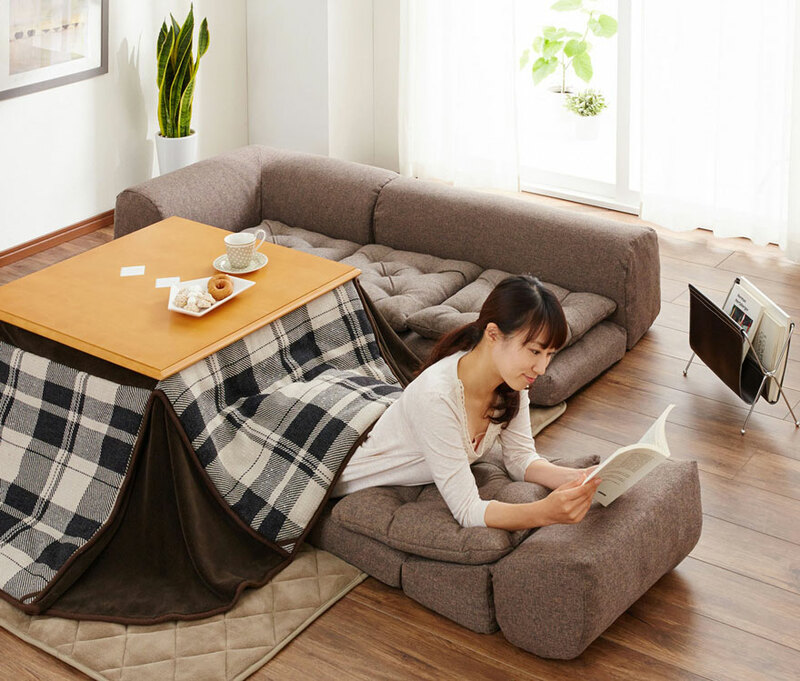 Kotatsu are available for purchase outside of Japan as well, but be sure to check the height as well as electrical compatibility. I first encountered them when I moved to Hiroshima in 1994. Missed them when I moved back to the US – even though I was living in Hawaii – and was so happy to have them back in my life when I returned to Japan a few years later. My family and I have every meal and do many of our activities (laptop work, homework, sewing, etc.) at the kotatsu. It is an invaluable part of our home and will follow us wherever we may end up living. For folks who want to get one in the USA, try http://www.mitsuwa.com.